Muslims from India are feared among the casualties after a white supremacist terrorist attacked two mosques in the New Zealand city of Christchurch on Friday. 49 people, including children and women, were killed in Friday’s terror attacks targeting the Al Noor and Linwood mosques in New Zealand’s worst ever terror attack. In New Delhi, Ministry of External affairs spokesperson, Raveesh Kumar said the High Commission was in touch with authorities, and that it was following the due process before announcing the number of Indian-origin persons among the victims. All India Majlis-E-Ittehadul Muslimeen Party (AIMIM) leader Asaduddin Owaisi, tweeted that a Hyderabad-native Ahmed Iqbal Jahangir is battling for his life after being injured in the shooting, and another Hyderabad-native Farhaj Ashan is reportedly missing. Ahmed Iqbal Jehangir, a 32-year-old resident of Amberpet area in the city, was grievously injured in the firing at one of the mosques where he had gone for Friday prayers. The whereabouts of Farhaj Ahsan from Tolichowki area, who was said to be in the same mosque, are not known. Brenton Harrison Tarrant, the 28-year-old Australian terrorist, who live-streamed his killing of innocent lives, has been charged with murder. Two other men and one woman were arrested in connection with the attack, two of whom remain in custody. New Zealand’s Prime Minister Jacinda Ardern said the assault on the mosques appeared to be a well-planned terrorist attack, and authorities have also warned Muslims not to visit mosques “anywhere in New Zealand”. 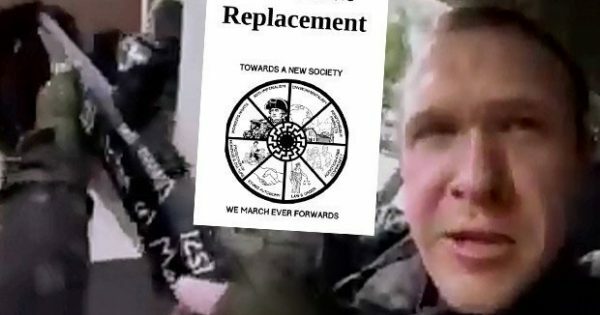 Tarrant, who New Zealand authorities said is a white nationalist and a Muslim hater published a racist anti-Muslim manifesto on Twitter, and other social media sites before the shooting. He then livestreamed his attack on Facebook. In his 74-page manifesto, Tarrant said he hoped to survive the attack to better spread his ideas in the media. He wrote that an attack in New Zealand would show that no place on earth was safe for immigrants. In his manifesto, he wrote that the victims were chosen because he saw them as invaders who would replace the white race. Photos of his guns reveal the names of his ‘idols’ and inspirations, mostly related to places, people and battles associated with violent conflict throughout history between Christians and Muslims. The manifesto has a part titled “to turks,” [sic] in which the writer threatens to kill all Turks living on the European side of Turkey and elsewhere in Europe. “We are coming for Constantinople and we will destroy every mosque and minaret in the city. The Hagia Sophia will be free of minarets and Constantinople will be rightfully christian [sic] owned once more,” the text continues. Throughout the manifesto, he highlights the conflict between Muslims and Europe’s Christendom, often framing it in terms of the Crusades.